In the second half of the 19th century, the regular national architecture was affected by the root principles of European architecture. There were new types of buildings - banks, schools, gymnasiums, universal shops, etc. The basic material to build thick walls was burned brick, which gave stability during earthquakes. 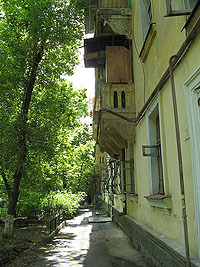 The architecture was eclectic in the majority of cases. In modern Uzbekistan , the material culture of more than 40 centuries has survived. The restoration school of Uzbekistan , which generated certain principles and traditions, has been established. In designing and construction, the appreciable use of national motives such as arches and domes are significant. Designs of new buildings are notable. The Alisher Navoi Opera and Ballet Theater in Tashkent by A. Shusev, and the " Tashkent " Hotel (now ) by M. Bulatov are noteworthy in engineering terms. The most complete reflection of modern principles and construction of new cities can be seen in Olmalyk, Zarafshon, Angren, and, especially, in Navoi. 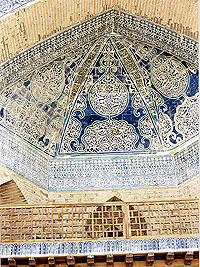 Considerable principles were kept during major restorations of historical cities such as Samarkand, Bukhara and Khiva, which are known to the world community by their unique architectural monuments. With independence came a new precondition for the development of national architecture and structural design. The development of the center of Tashkent became active. The capital has become unrecognizable. The central area, the Mustaqillik ( Independence ) Square, is constructed on a sample of many modern avenues, and intended for rare and important national parades. Currently it has modular metal towers with domes, a mobile amphitheater and panorama of Uzbekistan typed by electric lights. Even' year the main national holiday - Day of Independence - is celebrated here in the last night of summer with a variety of other events and activities carried out throughout the nation. Navruz (celebration of eastern New Year) is carried out every year in Uzbekistan. The National Park of Uzbekistan in Tashkent was named after Alisher Navoi and was specially constructed for this occasion. The park has a large fountain with its axis in the center. There is an amphitheater with angular towers and domes; the bridge stands through the channel, and on a hill -the pavilion with a dome and sculpture of Navoi. On both parts of a central amphitheater restaurant "Navruz" (1995, P. Yakubov, V. Ostroverkhov, N. Batalin) is located. There is a huge building of national Parliament - Oliy Majlis (1997, V. Akopjanyan) next to this park. Next to Ankhor canal the north from the Mustakillik Square the concert-building "Turkiston" is situated. The main facade of this modem building is reminiscent of Oriental mosques and madrasah. There is a sculpture representing a legendary bird of happiness khumo (artist - B. Jalalov) in front of the facade. Uzbekistan honors Amir Temur, the great ancestor of Uzbeks in whose era there was all kinds of architectural innovations and development. In Tashkent, Samarkand and Shakhrisabz, monuments were opened, and sculptures illustrated him for the first time. The monument (I. Jabbarov, F. Ashrafi, B. Usmanov) in Tashkent is established in Amir Temur Square, his namesake park. It has his words written in the pedestal: Power is in justice." One of the ideological monuments is the Museum of the Temur Dynasty (1995, A. Turdiev), located on the northwest comer of Amir Temur Square . In the architecture of the museum, the theme of a Guri-Amir dome was maintained. A horizontal dimension extends the proportions of a dome and a ceramics image, framing a building. The height of the dome is 30 meters, the diameter is 24x2 meters, and there is a huge luster in the middle of the museum. The dome is designed according to the traditional customs. 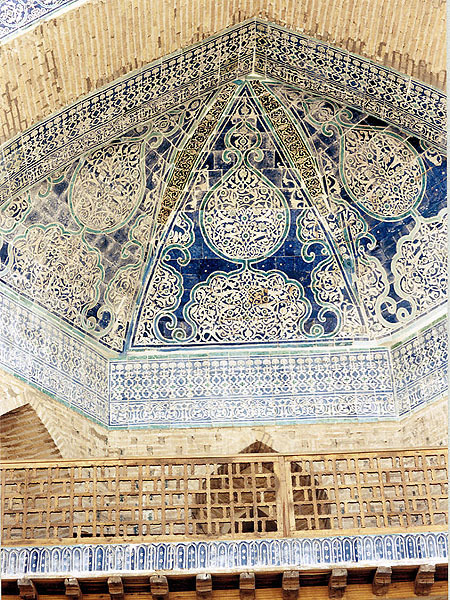 On a light-blue background, the gold allocates stresses, which come from the Tilla- Kori Madrasah in Samarkand . In an exposition hall Amir Temur's picturesque triptych serves as the main accent. The building is very close to traditional Uzbek architectural customs. New buildings in the Tashkent municipality (1996, F. Tursunov), and the Uzbek Parliament are fine examples of the classical style of architecture of public buildings.